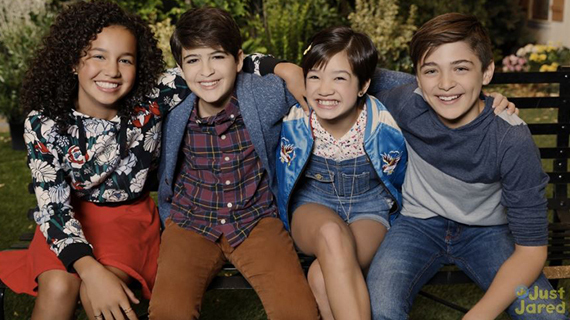 There is no doubt the cast members of Andi Mack are enjoying the lead up to the show’s big premiere on the Disney Channel App this Friday March 10. Need proof? Just check out their bright smiling faces as they took over Just Jared Junior’s instagram story. This premiere date couldn’t come soon enough because according to Bustle online many people are looking for Andi Mack to fill the Girl Meets World shaped hole in our hearts and give us Lizzie McGuire throwback feels. The series includes 13 comical and heartwarming episodes all filmed in locations throughout Utah like Liberty Park, Sugarhouse, the Avenues, Wasatch Junior High and Magna’s Main Street. According to the Salt Lake Tribune, “the production team has spruced up Magna, adding awnings and signs and turning an empty storefront into a cool restaurant.” Plus, the production brought in an estimated $9 million to the state. Though the filming schedule was jam packed for these actors filled with five day a week sessions followed by school work, they did manage to break away to explore. From a local’s perspective it never gets old seeing a visitor’s reaction to Utah’s unique weather and landscape. Check out the cast’s fun-filled day complete with a snowball fight at the Olympic Park filmed by KUTV. On Friday March 10, check your favorite Disney Channel streaming app for the new show that is sure to be nostalgic for some and fun for all. While you’re watching, keep an eye out for special glimpses of the Utah’s Wasatch mountains in the background (especially the scenes when Andi is in school.) The series will make its television broadcast debut April 7 at 8:30 ET on the Disney Channel.